18- to 24-year-olds: While relieved is the most common emotion (37%), this group is more likely to feel frustrated, confused and worried than any other age group. 25- to 34-year-olds: After relieved and happy (34%), this group is most likely to feel more appreciated than any other age group. 35- to 44-year-olds: After relieved (44%), this group is most likely to feel happy. It is also the age group that is most likely to feel excited. 45- to 54-year-olds: After relieved (43%), this group is most likely to feel confident, a feeling that it has more than any other age group. 55- to 64-year-olds: After relieved (43%), this group is most likely to feel frustrated and happy. 65-years-old or older: After feeling more relieved than any other age group (47%), this group is most likely to feel happy. Why is this important? Our research shows that emotion is the largest driver of customer loyalty. So companies must not only start talking about emotion, but they also need to develop unique approaches for dealing with different emotions across their customer segments. The bottom line: It’s time to make customer emotion a top priority. 18- to 24-year-olds: The most common emotion of the youngest consumers is happiness, and these young group are the happiest of any age level. They are also the most likely to feel appreciated (along with 35-to-44-year-olds) and angry. 25- to 34-year-olds: This age group is also most likely to feel happy, but are also the group that is most likely to feel excited, worried, and confused. 35- to 44-year-olds: This age group is also most likely to feel happy and is also the most likely (along with the youngsters) to feel appreciated. 45- to 54-year-olds: This age group is by far the most likely to feel frustrated and is the most frustrated of any age group. They are also the most likely to feel disappointed. 55- to 64-year-olds: This age group is most likely to feel frustrated and are also the age group that is least likely to feel happy or appreciated. 65-years-old or older: The most common emotion of the oldest consumers is feeling relieved, and they are the most relieved of any consumers. They are also the most likely to feel confident. In addition, they are the least likely to feel angry, excited, confused, or frustrated. In a previous post, I discussed results from a joint study that we conducted with Mattersight Personality Labs (MPL) to examine customer emotions within contact center interactions. MPL isolated the occurrence of four specific emotions: joy, anger, sadness, and fear in more than 118,000 calls across 11 large brands. In addition to detecting the customer emotion, we also analyzed the lengths of the calls, the percentage of calls transferred to other agents or supervisors, and the Net Promoter® Score (NPS®) provided by customers right after their calls. To normalize the analysis across companies, we divided the data for individual calls by company averages. So a “1.0” is equal to company average. While the previous post examined the individual emotions, this post looks at the combinations of the four emotions. While less than 1% of callers experienced all four emotions, it happened during more than 650 calls­—more than enough for us to analyze. Joy plus Fear creates the longest calls. When the calls contain all four emotions, they are almost two and a half times as long as an average call. The next two combinations, which are also more than two times as long as an average call, also contain joy and fear. Multiple emotions create longer calls. The only calls that are shorter than average are those where we could only detect sadness. The next shortest calls were those that only had joy and anger. Anger plus Fear creates the most transfers. When callers exhibit both anger and fear, the calls are transferred at a rate that is seven times the average. The next highest transfers also happen when the caller demonstrates fear. Joy creates the fewest transfers. The three types of calls that have the lowest transfer rates all contain joy, as do six out of seven. The only types of calls without joy that also have below average transfer rates are those that only contain sadness. Joy raises NPS. When a caller feels only joy, the call results in the highest NPS. Joy is also a part of the calls that earn the two next highest NPS. Anger plus other emotions lowers NPS. The lowest NPS occurs whenever anger is combined with another emotion. The worst combination is anger plus sadness. The bottom line: Anger and fear are terrible emotions to occur on a call. As you may know, Temkin Group labeled 2016 “The Year of Emotion” in its annual listing of customer experience trends. Why? Because emotion drives loyalty. And yet, despite its significant impact on customer loyalty, organizations do not focus on emotion enough. So to help increase organizations’ awareness of this critical area of customer experience, we created the Intensify Emotion Movement. 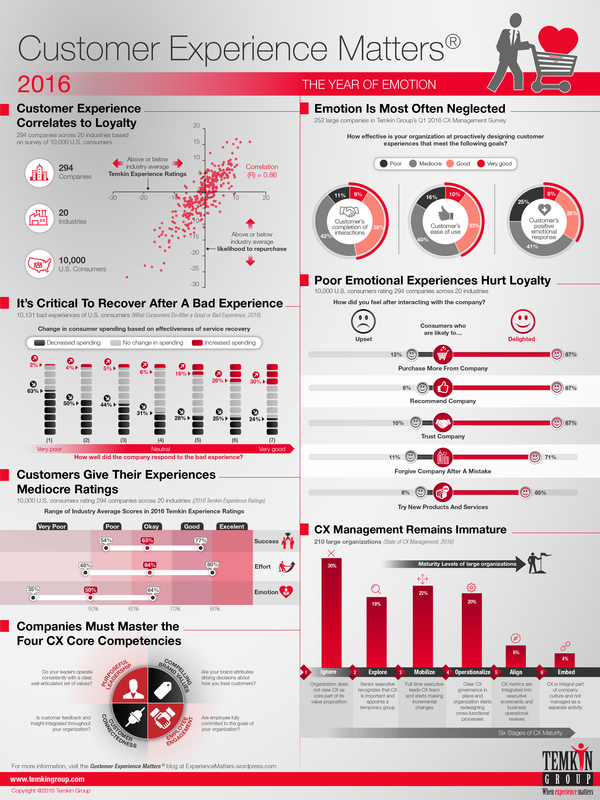 As part of our efforts to bring emotion to forefront of CX discussions, we worked with Mattersight Personality Labs to examine customer emotions within contact center interactions, a notorious hotbed of customer discontent. Analysts at Mattersight did the heavy lifting, applying the company’s analytical models to more than 118,000 calls across 11 large brands. While customers experience multiple emotions during every call, for this analysis we isolated the occurrence of four specific emotions: joy, anger, sadness, and fear. To normalize the data across companies, we divided the data for individual calls by company averages. So a “1.0” is equal to company average. Joy leads to best calls. No surprise, the only positive emotion we examined results in the highest NPS, the shortest calls, and the least frequent call transfers. Interestingly, the calls where we detected joy are actually slightly longer than average (although well less than the other three emotions). While we didn’t analyze the exact reasons why this happens, it could be caused by the willingness of the caller and agent to take a bit more time conversing when the customer feels happier and more friendly. Fear leads to most expensive calls. In instances when customers felt detectably fearful, the call time jumps to 87% higher than company average, by far the longest of any emotion. In these calls, we also found that the caller was transferred to another agent or supervisor more than 3.5-times as frequently as the company average. The NPS drops lower than average as well. Anger leads to lowest NPS. When customers experience anger, they give the lowest NPS (19% below company average). The calls are also 40% longer than average and are more than twice as likely to be transferred. Sadness leads to low NPS. Customers who experience sadness give companies an NPS that is only slightly higher than the one they give when they are angry (18% below company average).